The New York Rangers repaired a relationship from their past with an exquisite ceremony to celebrate the career of Jean Ratelle and retire his No. 19 sweater on Feb. 25. If you’re unfamiliar with the name, he may be the most underrated Ranger of all-time. It’s the highest honor that a professional athlete can have bestowed upon them, especially if you consider the amount of quality hockey players who have called Madison Square Garden home. The task of repairing the relationship was a few years in the making, but the goal of everyone involved was putting Ratelle in his rightful place along side other Ranger greats who have their numbers hanging from the rafters overlooking the ice. Ratelle’s resume is quite impressive as he played 16 of his 21 NHL seasons in the blue and white sweater of the Rangers. He is second on the all-time list of franchise goal scorers with 336 and scored 817 points during his time in New York. 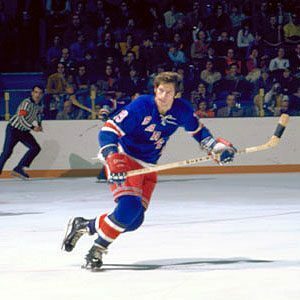 Ratelle eclipsed the 30-goal barrier six times with the Blueshirts, and was a member of Team Canada in the 1972 Summit Series against Russia. Above all, he was elected to the Hockey Hall of Fame in 1985. Yet, you hardly hear his name being mentioned as one of the greats from yesteryear by casual hockey fans, and maybe by today’s standards, Ratelle would be considered “Mr. Consistency” because his play was never flashy, just completing his task each night. Ratelle was a smart hockey player who rarely got rattled by the moment at hand, and formed one of the best lines with Rod Gilbert and Vic Hadfield in NHL history. Ratelle was an excellent forechecker that wasn’t afraid to do the required work along the boards to secure the puck and set his linemates with a quality scoring opportunity in the offensive zone. He played in an era where your position in the lineup was tedious at best, so you better produce each night or run the risk of being replaced. Think of Ratelle like fine wine, he improved with age each year. Once he hit his stride, Ratelle never looked back. Unfortunately, he was one of the best players to never win a Stanley Cup as the Rangers were snakebitten franchise for much of the 70s. It seemed too often, the organization was good enough to be a bridesmaid, but never the bride. Case in point, Ratelle was in the midst of a record-breaking (109 points in 63 games) scoring campaign before suffering a broken ankle with 16 games remaining in the season. Ratelle missed most of the 1971-72 Stanley Cup playoffs, but he was able to return for the Stanley Cup final against the Boston Bruins. His play was inconsistent as Ratelle couldn’t generate any quality scoring chances, and the Blueshirts lost to his future employer in six games. This was a bitter defeat for long-suffering Ranger fans, who thought this roster was perfectly designed to beat the Big Bad Bruins. It was ironic that his ceremony night took place on the day the Rangers traded away franchise elder statesman Rick Nash to the Bruins because some New York hockey fans still can’t fathom why the organization traded Ratelle and Brad Park away, let alone in the same trade. But, that occurred on Nov. 7, 1975, when the Rangers dealt those two to Boston in one of the biggest blockbuster trades ever in the NHL. 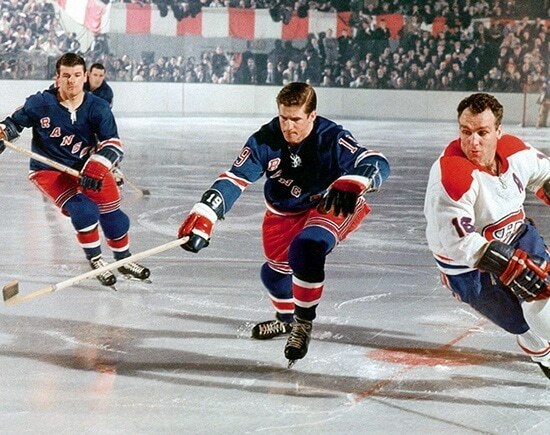 The Blueshirts acquired Phil Esposito and Carol Vadnais in return, which left all Ranger fans in a state of shock. For long-time Ranger fans, this weekend was bittersweet because one of their heroes was being honored for his contributions to the organization. Ratelle has been quiet and dignified in retirement, but he shined brightly once again on the Garden ice by accepting his place in franchise history with class and dignity that we come to expect. Yes, it was a good night to be at MSG.